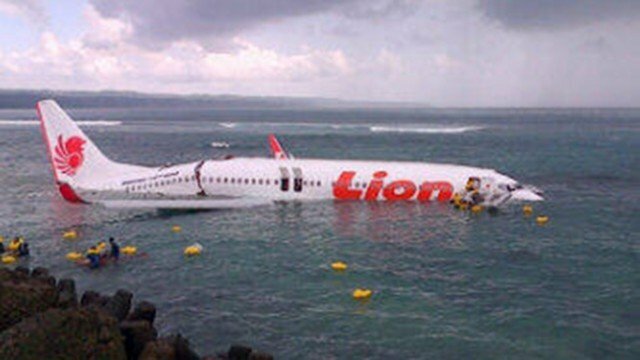 Everyone aboard a Lion Air passenger jet has survived after the plane has overshot a runway and ended up in the sea off Bali. At least 130 people were on board the plane belonging to Indonesia’s Lion Air, which was attempting to land at the island’s Denpasar airport. Photos posted on Twitter show a jet with a cracked fuselage sitting in water near rocks, with dinghies nearby. Some people were reportedly injured. It appears the Boeing was on a domestic flight from Bandung in West Java. Australia’s AAP news service says it tried to land at 15:00 local time. It came to rest 200-300 m (yards) from the end of the runway, Reuters news agency reports, quoting local media. An AFP news agency journalist in Denpasar saw seven passengers, all of whom appeared to be Indonesian, arrive by ambulance at a hospital with light wounds to their heads, arms and legs. It was not immediately clear how many people were injured or what the nationalities of the passengers were, the agency added. Bali is one of Indonesia’s top holiday destinations, popular with foreign tourists.